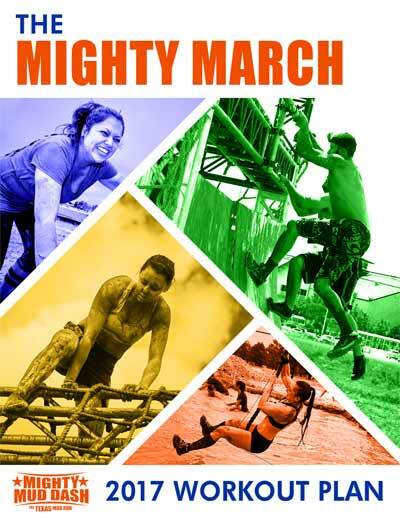 Want to do a mud run, but feel that you don’t have the strength or courage to take it on? For 2017, we are introducing a new four-week workout schedule that you can follow to better prepare yourself for the upcoming Mighty Mud Dash on April 1st-2nd and beyond. Our plan is based on the High Intensity Interval Training (HIIT) system that’s been scientifically proven to maximize gains in fitness, strength, and endurance in a short period of time. It consists of a series of short, simple, easy-to-follow workout routines with periods of rest in between. The workout plan begins on March 5th and goes until the day of the race. We recommend downloading the PDF beforehand to get an idea of the schedule and what the plan consists of. You are free to start the workout earlier, or you can even start it later from the current day. Either way, we hope you make the most of this plan as a way to help unlock your true potential and ready yourself for the upcoming mud run.